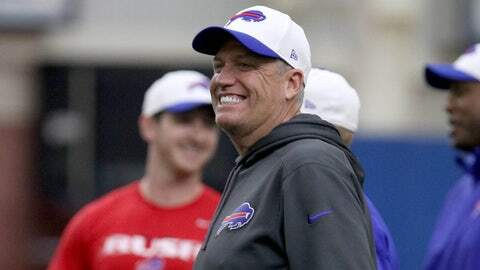 Rex Ryan showed up at practice with a Sabres jersey in support of the team's season opener. The city of Buffalo will have to wait until Oct. 18 until their Bills return home, but there's no shortage of events going on until then. The Buffalo Sabres open their season on Thursday night at home against the Ottawa Senators, so Rex Ryan made a wardrobe change for practice. Rather than rocking the royal and red, Ryan donned a Sabres jersey and hat in honor of opening night. Not only did Ryan wear Sabres gear to practice and his press conference Thursday, but he'll be in attendance at the game Thursday night. There's no doubt he (and everyone else) will have his eyes on rookie phenom Jack Eichel as he makes his NHL debut for the Sabres.